Air Bearings Ltd (ABL), one of the world’s leading suppliers of air bearing solutions, utilises Vision Engineering’s Lynx eyepieceless stereo zoom microscope for the critical inspection of machined component parts. The component parts form a spindle with rotational speeds up to a staggering 350,000 RPM, and therefore inspection of the component parts is critical in maintaining optimum performance at this impressive speed of rotation. ABL, established in 1993, is dedicated to the design, manufacture and service of high quality, competitively priced air bearing spindles for a variety of specialist applications. A Hitachi company, ABL are dedicated to providing spindles for specific industrial applications including precision grinding, non-ferrous turning and milling and PCB drilling. Integration of quality control throughout the manufacturing process is fundamental to production, enabling ABL to achieve high levels of performance from their products. With a range of spindles operating between 80,000 and an incredible 350,000 rpm, it’s imperative that critical components are machined with sub micron accuracy. Nearly all components are manufactured in house with only a small amount of work outsourced to sub contractors including specialist processes such as heat treatment, anodising and shaft coppering. The milling is optically inspected for burrs, eroded edges and scores on the surface of the metal. This is vital in ensuring the copper is easily and precisely deposited onto the shaft. If the surface finish is not clean and precise the copper will not adhere to the shaft. Components manufactured at ABL which are critical to the function of the spindle are subject to 100% inspection. Other components with lower fuction emphasis are batch inspected. Optical inspection procedures are conducted under the optics of the Lynx stereo zoom microscope. The Lynx is a revolutionary zoom stereo microscope which removes the need for restrictive microscope eyepieces by employing patented eyepieceless technology. The result is an ergonomic microscope delivering optimum operator comfort through fatigue free viewing, increasing productivity and accuracy. Adrian continues to explain the advantage of using a Lynx as a stereo inspection tool. The oblique and direct viewer is an optical accessory enabling engineers to view components from a 34º angle which can then rotate a full 360º to provide easy inspection all the way around a component, allowing operators to switch between direct and oblique views. The Lynx microscope also has a camera attachment supporting the quality process where questionable differences can be captured digitally, circulated electronically and documented as part of the continuous improvement for quality. Another critical component within ABL spindles are the air bearings themselves, each containing jets that control the film of air between the shaft and the bearing. Amongst many other components, the fitted jets are crucial to the functionality of the spindle and are inspected 100%. 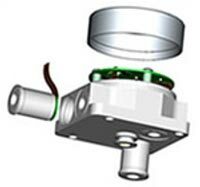 The air passing through the jets provides a cushioning between the shaft and the bearing allowing for free rotation. Although some of the jets are only microns in aperture they are inspected under the Lynx for the quality of the machining and to ensure that the chamfers are clean with no ragged edges. 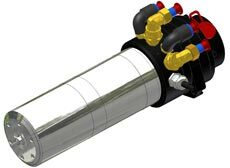 Also the pocket size, form and depth have to be perfect as any irregularity could cause problems with the air flow resulting in the shaft colliding with other components in the spindle. “The oblique viewer gives you that extra dimension and there is no other way we can do it. We get so much use out of the Lynx for our applications. It is invaluable and an absolute godsend” says Adrian. ABL have been manufacturing for many years and the integration of quality control throughout their design, manufacturing, assembly and test processes has enabled ABL to achieve levels of performance that are admired by their customers and the envy of their competitors. ABL’s facility is very well equipped with the very latest equipment. Modern technology combined with tried and tested traditional methods and a skilled workforce ensure that ABL produces components manufactured with absolute precision. With expansion at a rapid rate, ABL are leading the way in utilising air bearing technology. With the demand for smaller, faster spindles constantly increasing, ABL can develop their business yet continue to provide customers with products skilfully manufactured to high precision. Given their deformable nature, precise rubber components raise a variety of gauging challenges. As conventional physical measuring techniques are liable to distort rubber components’ geometry and have an adverse effect on the accuracy of a gauging routine, non-contact measuring methods have long been regarded as the best means of achieving optimum accuracy. Although equipment such as profile projectors has traditionally been employed for measuring rubber components, the advent of high-accuracy, 3-axis non-contact video measuring systems, means that previously unimagined accuracy levels can now be achieved and the most complex of component features can now be precisely inspected. Since its inception in 1978 Butser Rubber has gained an excellent global reputation as a first class manufacturer of high-quality, custom-built rubber components. The burgeoning company’s rise to eminence has resulted in it becoming a key supplier to a wide range of demanding industries including the aerospace, automotive, motorsport, chemical, oil, defence, electrical, marine and medical sectors. From its high-tech design and manufacturing plant, based in Liss, Hampshire, the company is capable of undertaking contracts for the supply of one-off components, to very high-volume production runs. Butser Rubber’s range of customer focused services begin prior to manufacturing, by applying the company’s high levels of expertise at an early stage in the design process, optimum, cost-effective solution being applied to all customer’s applications. Whilst high levels of technical expertise within the field of accurate rubber moulding allows the production of a wide range of high quality goods, including precision gaskets and fabrications in natural, synthetic and spec polymers. Supplying critical rubber components to today’s aircraft systems means that Butser Rubber strives continuously to improve material technology and production processes, as a result the company’s components can be found on the majority of commercial aircraft that are currently in service. In contrast to the company’s cutting edge design and performance aerospace work, Butser Rubber is also engaged in the restoration and remanufacturing of pattern parts for World War 2 flying legends, such as those involved in the Battle of Britain Memorial flight. Reflecting the reputation for the quality of the company’s products, Butser Rubber supply a range of components, including sealing, anti-vibration and flexible solutions, to all of the current Formula One teams, either directly or through teams’ engine and transmission builders. Working within the demanding Formula One sector has given the Butser Rubber an in-depth understanding of the global motor sport industry. This knowledge has lead to the company building key components for cars involved in The ‘World Rally Championship’, ‘British GT Series’, ‘Formula Nippon’, ‘GP’ and ‘Le Mans 24’. An ISO 9001:2008 accredited company with full traceability to all raw material sources; Butser Rubber can supply rubber and rubber fabrications to a range of Defence Standards including natural rubber to NRQX. A stringent quality ethos permeates all aspects of the company’s endeavours, whilst highly trained staff ensures full control of every in-house process and all materials used. Relying heavily on the principles of TQM plus other modern quality tools such as Poka Yoka, Kaizen, 5S’s 7 Muda, the company has designed and implemented a continuous improvement programme to drive it towards the goal of zero internal defects. To help uphold the company’s hard won reputation for quality, Butser Rubber make regular investments in the latest inspection equipment, a case in point was the company’s recent purchase of a Falcon Video Measuring Machine from Vision Engineering. When the requirement for a high-accuracy, 3-axis non-contact video measuring system arose, impressed by the contribution made by the company’s Mantis units and the service provided by Vision Engineering, a demonstration of Vision’s recently launched Falcon was requested. Vision Engineering’s Falcon 5000 incorporates over 50 years of proven optical experience, in a high accuracy 3-axis non-contact video measuring system. Encompassing many technical innovations, the advanced Vision Engineering products delivers high accuracy measurement results within a compact footprint, yet is suitable for both shop-floor quality control and manufacturing inspection applications. Falcon provides fast and accurate 3-axis measurement of both routine and complex precision component parts. From simple, single-feature operations, to multi-point video edge detection measurements, Falcon combines class-leading simplicity with high accuracy and repeatability. 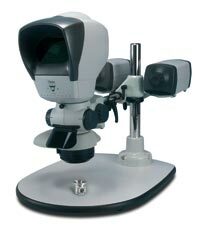 Vision Engineering’s value-for-money, 3-axis video measuring system capabilities include, high resolution indexed zoom optics, offering high precision and improved flexibility in a compact design. Falcon boasts a large field of view for easy sample orientation and unique surface and substage iris aperture control for adjusting the depth of field. 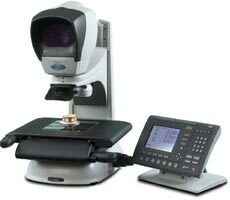 Other advanced standard features include, progressive motorised Z-axis control, controllable quadrant LED illumination and both high and low magnification lens options. Ultimately, the Falcon has been designed to make the measurement procedure as simplistic as possible, with ergonomically designed system adjustments and intuitive software allowing for fast navigation. The Institute of Stem Cells in the Treatment and Study of Monogenic Diseases (ISCMD), a Genopole® International Research Laboratory, in Evry near Paris, is utilising Vision Engineering’s Lynx stereo zoom microscope in their sealed extraction cabinets. The eyepieceless optics of the Lynx means it can be placed behind the glass within the cabinets allowing operators to inspect the live stem cells in both brightfield & darkfield illumination up to 40x magnification. ISCMD is based in Evry, near Paris in France. ISCMD is a research laboratory of Genopole® International and is dedicated to improving our knowledge and understanding of stem cells for the development of therapies for human diseases like Parkinson’s disease, Alzheimer’s disease, heart disease, stroke, arthritis, diabetes, burns and spinal cord damage. During stem cell research, scientists need to implement a number of processes including the harvesting, inspection and the dissection of cells. To minimise degeneration and contamination, sealed extraction cabinets are used so that scientists can carry out their procedures from outside the cabinet, while the cells are magnified inside the cabinet by the Lynx biological microscope. Traditionally, it would have been difficult to inspect the stem cells under magnification because the eyepieces of the microscope would have been inside the laminar flow cabinet. However, as the Lynx does not have eyepieces but benefits from a viewer, the operator does not need to place their eyes directly in front of the binocular eyepieces. Vision Engineering’s patented Dynascope® head is the key feature of the Lynx, allowing the system to deliver optimum clarity and pin sharp accuracy through a viewer instead of binocular eyepieces. It is the ‘eyepieceless’ viewer that allows the Lynx to be utilised behind the glass, where the operator can view the subject without the need to be directly in contact with the microscope. Unlike conventional microscopes that have binocular eyepieces, the Lynx (with the ‘eyepieceless’ viewer) allows operators to wear prescription spectacles, even while the operator is viewing the subject through the microscope, when it is inside the laminar flow cabinet. The scientists at ISCMD concentrate on harvesting the stem cells so that they can be used for further research. Usually the stem cells are harvested within incubators but, once the cells have been successfully harvested, they require the scientists to dissect the samples to separate the cells using a micro manipulation pipette. This delicate process requires high magnification and superb clarity, to enable the scientists achieve accurate dissections. In addition to the high clarity through the unique Dynascope® head, the Lynx research microscope enhances the contrast of the stem cells by the tilting mirror within the substage of the unit. This creates a pseudo effect for both darkfield and brightfield maximising the contrast of the cells for both inspection and manipulation. Both the darkfield and the brightfiled are important features for both dissection and inspection. Inspecting the stem cells for their structure, any granulation and the general morphology of the cells is important for maintaining the continuing high quality of the samples. If the cells had started to degenerate and the morphology of the cells were not up to the required standard, the time and money wasted using them for research would be costly. Anthony Laurie of DentAL Excellence Ltd operates a technical dental laboratory in the heart of London and bases his business around the delivery of exceptional dental restorations to his demanding customer base. Tony introduced advanced Vision Engineering Mantis magnification for all of his technicians. The need for this level of magnification equipment is explored. Many famous people make use of dental restoration to enhance their appearance and while this type of treatment was only available to a limited group of people it is becoming more widely used. Dental restorations include clinical need as well as aesthetic need, with restorations used in the treatment of accidents and illness. The process for the creation of dental restorations has developed in recent years due to pressure in the dental market place and the introduction of technically superior material products and manufacturing technology. New materials have forced the dental industry worldwide to re-examine the application of materials to the art of dental restoration. What is seen in the photographs and smile today was in the mind and hands of the dental technician yesterday. It is the technician who determines the quality of the restoration that in turn defines the smile, the bite and the chew. Initially, the patient has a consultation where the dentist provides a prescription for reconstruction to restore ideal jaw function or to improve aesthetics. The process of manufacturing dental restoration begins with the preparation of the existing teeth or providing implants in the mouth. When prepared, the dentist takes an impression of the teeth and surrounding tissues. The patient is fitted with temporary restorations to protect the prepared areas and impressions are taken, to be sent to the dental laboratory, together with any other relevant information on the patient’s clinical situation. Even at this early stage, it is vital that the impressions are free of defects. From the impressions, stone models are made of the upper and lower jaws which are then articulated together to represent the patient’s bite. The stone model of interest is sectioned at the location of the restoration and the prepared areas are removed and trimmed. The artistry of the technician now comes to the fore as he makes a wax version of the restoration. The wax is used to cast the frame of the restoration and the frame will carry the porcelain surfaces and connect to the carrying teeth or detail implants. When the technician, the dentist and patient are happy, the crown or bridge is permanently cemented or bonded in place. Some dental technicians and dentists are willing to accept poor quality for restoration and these can be can be delivered and fitted. It is obvious where the poor fit of the crowns has caused the gums to recede, exposing dark margins and collecting decay. The Clinical failure of these restorations may only come to light many months after the fitting, and only be seen by the dentist. The implications of a poor clinical fit are poor dental hygiene and dental work being required soon after the fitting. The poor manufacture and fitting of dental restorations can cause medical issues and do not look good on the patient. For this reason the quality of the restoration should be checked at every stage of manufacture to assure that the manufacturing will provide a high quality restoration and a high quality of clinical fit assuring long service life and excellent aesthetics. ”In all cases my technicians make use of magnification to check the build and fit of our restorations. “We check at each stage of the process and it is this attention to detail and the high quality magnified images from our Mantis systems which allow us to detect any minor issues and to correct them at the earliest opportunity. A restoration does have a manufacturing problem then there may be a cumulative effect as at each stage of the process the errors can be amplified. Adding value to a restoration which may be clinically inferior at best or rejected at worst is a costly error for the business. Figure 4 shows four anterior porcelain jacket crowns, three of which were 30 years old. It is obvious where the poor fit of the crowns has caused the gums to recede, exposing dark margins & collecting decay. Figure 5 shows the same patient with newly fitted crowns. The gums look extremely healthy and the aesthetic result is excellent. “With each technician checking the work at each stage of the process we have both a high quality product in technology terms and a high quality product in aesthetic terms. The use of Mantis® is an enabling technology and keeps all of my technicians happy. DentAL Excellence is high quality specialist restorative and implant technology laboratory together with a state of the art training facility and was founded by Anthony Laurie to design, produce dental restorations using the latest CAD-CAM, laser, induction casting and digital technologies. DentAL Excellence also provides a high level of training for the industry. GE Druck (a division of GE Sensing) is utilising Vision Engineering’s range of optical measurement and inspection systems to maximise the quality standards in their aerospace sensing equipment. GE Druck, based in Leicestershire, is a UK Division of GE Sensing. One of the main product areas at this site is the production of a variety of pressure sensors that are used in a diverse range of industries including aerospace. Sensor products measure pressures from less than 0.015 psi to 15,000 psi range and range from relatively low cost OEM devices to very high accuracy resonant silicon barometric sensors. Instruments include pressure indicators, portable calibrators, and Air Data Test Sets used to calibrate aircraft pitot static instruments from all types of aircraft from helicopters to supersonic fighters. From air data to aircraft fuel systems and flight control to engine monitoring, GE Sensing plays a vital role in a multitude of demanding ground/flight test and in-flight pressure measurement applications for the global aerospace industry. Demanding customers require high quality products and to that end instruments and sensors are produced in accordance with stringent quality systems at each stage of the production process. In addition GE Druck strives to improve product quality still further and 6 Sigma methodologies are incorporated into continuous improvement activities throughout the production process. Electron Beam Welding (EBW) is a fusion joining process that produces a weld by focusing a beam of high-energy electrons to heat the weld joint. Electrons are elementary atomic particles characterized by a negative charge and an extremely small mass. Raising electrons to a high-energy state by accelerating them to roughly 30 to 70 percent of the speed of light provides the energy to melt metals. By controlling the energy level (Accelerating Voltage), number of electrons/sec (Beam Current), Beam Spot size (Focus) and weld speed an extremely repeatable weld can be performed. A narrow weld profile is the result, which provides low distortion and very low heat input thus preventing damage to sensitive components contained inside the sensor. Pressure sensors incorporate a number of EB Welds in their construction (up to 15 on a complex multi-sensor Aerospace product). Any defect can cause a unit to be scrapped and any non-conforming product needs to be identified and removed from the production process so as not to incur additional work and expense. A programme of work was undertaken to improve yield through the EBW process. One issue was that acceptability of a weld profile was largely subjective against a visual standard and occasionally product could be deemed acceptable in production only to be rejected at final inspection where the cost of scrap is at its highest level. British Standard BS EN 13919-1 provides guidelines categorizing defect types, these were designated as Spits, Undercuts, Excess Weld Material, Misalignment and Sinks. The standard also provides guidance for allowable sizes of acceptable defect but since the allowable defect size is related to weld depth (which could be less than 0.5 mm) an accurate, repeatable method of determining the small dimensions in x, y and z was required. For example the maximum allowance for a sink below parent material in a weld profile for a critical pressure containment weld could be as small as 0.05mm. Steve Broadbridge, Product Improvement Manager at GE Druck, investigated several methods for accurately measuring the dimensions of weld imperfections before deciding to invest in optical non-contact method of measuring. To meet the demanding requirements of a measuring system, an accurate solution was adopted in the form of a Hawk non-contact measuring system from Vision Engineering. The Hawk system offers accurate measurement, repeatability and reproducibility in three dimensions. If the welds require measurement for categorisation, the sensor body is simply placed on the high accuracy 150mm x 150mm measuring stage and then using the magnification options, the welds are measured in X, Y and Z. Once the Microprocessor has recorded the measurements, they are compared to inspection standards in accordance with BS EN 13919-1. GE Druck is increasingly providing a diverse range of solutions for instrumentation for all industries. With new technology striving ahead to meet with the demands of quicker, smaller and more accurate instrumentation, GE Druck is expanding and diversifying rapidly to meet with such demands. In doing so they are investing in equipment that ensures the highest levels of accuracy and quality of the components that make up their comprehensive range of instrumentation. Vision Engineering has developed Hawk®, a unique non-contact measurement system that is the first to offer both a true optical image display combined with fully automatic video edge detection. Both of these technologies have been available individually but never before as a combined package. Hawk can be run either manually, motorised or in fully automatic mode. For rapid product changeover, manual operation allows for very quick setup in any measurement task. For high volume throughput, automation allows repeated, objective inspection much faster than manual measurement. In between these extremes, there are a whole host of application areas that benefit from partial automation – where components can not be automatically checked or where product variety makes multiple measurement routines impractical. Hawk allows both techniques to be used in one system, and this opens up many opportunities where previously either technology alone would be insufficient. One significant application area for the new Hawk technology is moulded automotive component inspection. Automotive components have critical quality requirements in terms of function, tolerance and aesthetic appearance. Increasingly, plastic components are being used in automotive manufacture where previously steel or aluminium would have been necessary. This isn’t simply limited to interior trim but includes mechanical components as well. While reducing overall weight and improving the cosmetic finish available, this trend does demand that the manufacturing criteria on such plastic components now equates to that previously associated with machined metal. Automotive mouldings tend to be manufactured in dark, low contrast colours; most frequently, black, near black or various shades of grey. As a result, these components coordinate well with the huge variety of colour schemes available in today’s car. Whilst this is good for the car designer, it makes accurate viewing and gauging much more problematic. To measure a black low contrast object on a black low contrast background presents significant challenges to most non-contact measurement systems. This is where the unique benefits of the Hawk system come in to play. As an example, a Peugeot climate control fascia panel is moulded in very dark grey. This panel must fit exactly into the climate control assembly or the unit may rattle and the driver would see a bad fit. This panel is sub-contract manufactured in high volume and requires several key measurements to be accurately verified. An operator using an optical system may not be cost effective because many of them are highly repetitive. An automated video based system would face difficulties because the contrast between black on black edges is too low. The solution is the combined approach as used by Hawk. The basic, clearly defined edges can be automatically measured using Video Edge Detection (VED) technology. This allows for the majority of the checks to be fully automated, relieving an operator from time consuming, repetitive tasks. Once these are completed, the patented optical display head can be used, allowing the operator to use subjective experience and the ability to manually define a feature to measure the difficult, low contrast features. The result is a system that offers the best of both worlds. Patented Dynascope technology presents a clear, pure optical image to the operator through the expanded exit pupil display head. This image has not been digitised and will not suffer from loss of colour rendition or contrast problems. Video based systems always suffer when viewing low contrast black on black, white on white or transparent features, as typified by many automotive mouldings. The human brain is by far the most powerful image processing system available and for difficult optical subjects, the best results will come from a pure optical image being presented to a human operator. Using a fully automated Hawk system, the majority of measurements can be controlled by the PC software with just complex parts being presented to the operator, who can input edge locations. Over specification has become a problem in the production environment. Usability is equally important as capability on today’s shop floor, as a powerful and all capable system will only earn its keep if it can be used, day to day by production staff. It is this thinking that has driven the development of the Hawk family to be “designed by engineers, for engineers”. Reduced inspection cycle time and improved repeatability. Hawk is intended to be used on or close to the shop floor, directly, by the multi-skilled, non-specialist engineers who run the manufacturing process. Because components can be taken directly from the moulding or machining station to the Hawk, feedback is rapid and directly to where the information is needed. If the component is distorted or out of tolerance, remedial action can be taken immediately. Hawk can be set up to run manually or fully automatically. With the Peugeot climate control panel moulding, this means that initial pre-production runs can be closely monitored and measured using a completely manual inspection setup. The flexibility of manual operation means that changes can be quickly accommodated without the need for skilled programming knowledge. Once volume production is begun, many of these checks or measurements can be fully automated, resulting in higher throughput, reduced inspection cycle time and improved repeatability. As automotive mouldings become more complex and quality critical, consumers grow more demanding and have higher expectations. This all drives the need for non-contact measurement systems that are accurate, user friendly and capable of measuring optically difficult components in volume. The Hawk has landed. GE Druck (a division of GE Sensing) is utilising Vision Engineering’s range of optical measurement and inspection systems to maximise the quality standards in their sensing equipment. GE Druck is the UK Division of GE Infrastructure Sensing, based in Leicestershire. One of the main product areas at this site is the production of a variety of sensors which are used in a diverse range of industries including healthcare, oil and gas, telecommunications and transportation. The Druck product name has long been associated with precision pressure sensors and related test/calibration instruments. Their product range includes relatively low cost OEM devices to very high accuracy resonant silicon barometric sensors measuring pressures from less than 0.015psi to 15,000psi. In addition, the Druck product range includes Air Data Test Sets used to calibrate aircraft pitot static instruments from helicopters to supersonic fighters. From air data to aircraft fuel systems and flight control to engine monitoring, GE Infrastructure Sensing plays a vital role in a multitude of demanding ground/flight test and in-flight pressure measurement applications for the global aerospace industry. Products include pressure sensors and test equipment, used extensively by manufacturers and airlines for fixed and rotary wing aircraft throughout the civil and military sectors. Industry approvals include CAA/FAA and compliance with the latest RVSM standards. The instrumentation, as well as a range of sensors are manufactured at the GE Druck’s Leicestershire site and are produced in accordance with numerous management systems, giving each stage of the production a bench mark for excellence. Part of the quality procedures require GE Druck to meet with extremely high standards in all aspects of their production. GE Druck utilise Vision Engineering’s systems in a number of areas where their instrumentation is assembled, which includes the assembly of the outer casing of pressure sensor bodies used for aerospace. Sensors used for aerospace are extremely sensitive and need to be accurate to nearest micron which is why an electron beam welding process is used to weld the outer casing because it minimises distortion and shrinkage. Electron beam welding is a process joining two components by merging them with a stream of high velocity electrons accelerating at more than 100,000 miles per second. This method of welding produces power intensities 5,000 times greater than conventional welding because the beam is concentrated to a precise area of 0.2mm in diameter. Repeatability is high with this welding technique with maximum control governed by a filament current that controls the rate of electron emissions, and accelerating voltage which regulates the kinetic energy of the electrons. The compound used to weld the two components is usually a re-melt of the component material itself. This welding technique provides the engineer with the capabilities of welding otherwise inaccessible locations, although easier locations minimise the process time and therefore increase productivity. Benefits of the electron beam welding process include: precise control over penetration and dimensions; high level of repeatability; freedom from impurities; negligible distortion and shrinkage. Although this welding process may initially seem an advanced and unnecessarily costly alternative to conventional welding, the numerous benefits and the saving on additional operations for example, stress relieving, reduces the overall cost of producing the product. The welding process is used to weld the sensing plate and at this stage it is crucial that the weld meets with the specification otherwise any discrepancies could be costly. After the sensor plate has been welded, but before the sensor is built up to its fully functioning capacity, the welds on the sensor plate are inspected using a Lynx stereo zoom microscope from Vision Engineering. The penetration of the weld can be as shallow as 5µm which is why a high magnification view is important. The welds on the sensor plate are inspected for cracks, spits, misalignment and undercutting. It is important for GE Druck to obtain guidance on imperfections for example, what welds are unusable and what welds are re-workable. They have successfully achieved this by implementing a British Standard BS EN 13919-1 guidance on quantity levels for imperfections in electron beam welding joints in stainless steel. If there are any imperfections found during the inspection process, the welds on the sensor body are measured for categorisation in accordance with the standard they have employed. BS EN 13919-1 provide guidance to GE Druck to enable them to make objective decisions about any slight inaccuracies that may have occurred during the electron beam weld process. For example, they may find that the penetration of a weld has increased by 5µm and would therefore like to check if there would be any repercussions. This is especially important for components that would inevitably form part of instrumentation (such as sensors) for the aerospace industry. There is no room for marginal error on these highly accurate and intelligent sensors. As the penetration and dimensions of the welds can vary (depending on the sensor type), GE Druck considered several measurement options that would meet with their requirements including tight tolerance measurement in X, Y and Z. Due to the sensitivity and tight tolerances of the sensors that are manufactured, an accurate non-contact measuring solution was adopted in the form of a Hawk non-contact system from Vision Engineering. Optimax Imaging and Measurement Limited are specialists in measurement and provided GE Druck with the Vision Engineering measurement solution they required. Peter Clements, Managing Director of Optimax suggested the Hawk system would be the most appropriate solution to meet the needs of Stephen Broadbridge, Departmental Manager at GE Druck. Stephen Broadbridge investigated several methods for accurately measuring the weld dimensions before deciding to invest in optical non-contact method of measuring. Once the Microprocessor has recorded the measurements, they are input into an analysis table which provides a level of acceptance and consequence of the dimensions in accordance with BS EN 13919-1. Stephen Broadbridge, Departmental Manager explains the importance of implementing a standard and a process for electron beam welding. “To maximise the quality and the precision of our welds, we firstly inspect the sensor plate to makes sure there are not discrepancies in both finish and dimension and then if we feel that any aspect of the weld is questionable we measure the weld in X, Y and Z”. “We have found that using the Hawk provides us with an optical image which allows us to easily find the edges of the welds enabling our engineers to be precise in their measurements in all axes”. Cinch Connectors Ltd has invested in four Lynx Stereo Zoom Microscopes to inspect their wide range of connectors, from their Goods-In department through to their Quality Department, the microscopes are utilised by Cinch because of their superior viewing heads and quality optics. Operating since 1917, Cinch Connectors Limited, based in Nottinghamshire (and in Illinois, USA), manufacture a wide range of connectors primarily for telecommunications and transportation, in addition to supplying the aerospace and defence industry. Cinch Connectors Limited design and manufacture a range of harnesses in addition to their range of connectors, for end user commissions to general supply of mainstream electronic distributors such as Farnell and RS Components. Cinch’s connector and harness solutions are generally hand assembled due to their bespoke and high-end performance, and so therefore each component part and stage of assembly requires manual inspection for imperfections. The high-end connectors (usually for defence and aerospace) are manufactured with only 10-20 units in each batch which illustrates the quality, technology and individuality of these commissioned connectors. inspected by the Lynx microscope. One such connector, the CIN::APSE is a solderless Z-axis interconnect technology that offers exceptional mechanical and electrical performance, which can be customised to users requirements. Utilised in the aerospace industry, the CIN::APSE is an ideal solution because it is small, with low inductance, and exceptional resistance to shock, vibration and thermal cycling. Cinch’s Microminiature Dura-Con line of connectors qualified (QPL) to MIL-DTL-83513 is one of the most widely used 0.050 inch (1.27mm) pitch connectors for military and high-end commercial applications. Dura-Con is ideal where packaging requires a small size and low weight, as well as a highly reliable and rugged connector that has electrical and mechanical integrity under extreme vibration and shock conditions. The heart of the Dura-Con System is the unique wire form pin that provides seven points of contact when mated to the socket. Whether Cinch is manufacturing a batch of CIN::APSE or a batch of their Microminiature Dura-Con connectors, 100% inspection is crucial to ensure the highest levels of quality are maintained. For example, some of the connector bodies are supplied with nickel plating and this requires inspection in case the finish is chipped or scratched. If the plating is imperfect on a single connector and is then built up with the harness, the harness is difficult to disassemble and therefore all of the components have to be wasted – a very expensive exercise. Thorough manual inspection is therefore essential, making sure each component meets with the gold standard at every point of the manufacturing process, preventing unnecessary wastage. In addition to the inspection of each component in the Goods-in department, Cinch utilise magnification throughout the manufacturing process, to final inspection, before the connectors are dispatched. Most of the assembly points benefit from bench magnifiers, but with today’s technology requiring smaller, faster and robust specifications, greater magnification is required. In addition, Cinch employ many experienced technical personnel who spend long hours inspecting components and fully assembled connectors. This is often very tiring and so to maximise their comfort and therefore optimise accuracy and throughput, Cinch has invested in four Lynx stereo zoom microscopes from Vision Engineering Ltd. The Lynx offers much greater magnification than the bench magnifier, with up to 120x zoom capability. However, unlike a traditional stereo microscope, the Lynx benefits from a patented viewing head called a DynascopeTM allowing for inspection to be conducted without the disadvantage of peering through eyepieces, therefore enhancing operator comfort as well as greater accuracy and productivity. Fig. 2.0. Shows one of the experienced technical team inspecting component parts through the Lynx’s patented viewing head. Offering superior optical views of component parts, the Lynx allows users to inspect in high resolution, contrast and clarity, in addition to the advantages of the long working distance and wide range of accessories such as digital image capture options for reporting. This allows for a wide range of parts to be inspected for possible imperfections including: wicking of the pins; quality of the solder joints; or general damaged caused during the assembly process. With some of the connectors used in critical applications such as aerospace, it is essential the connectors and harnesses are supplied to customers at the high standard they require from Cinch Connectors Limited. With technology evolving, so both speed and size are key requirements, Cinch Connectors are continually exceeding their customer’s expectations by providing innovative solutions to the rapidly changing needs of the markets. Their investment in technology and capable instrumentation (such as the Lynx), makes sure there are no limitations when it comes to connector capabilities or any compromises on quality or functionality. By switching to the revolutionary Lynx microscope, one of the world’s largest paper producers has eliminated the fatigue and strain of using traditional microscopes for sample inspection, dramatically enhancing productivity. To limit operator fatigue from eye, neck and back strain, Donohue only allowed its operators to manually inspect paper samples for a maximum of two hours when using traditional scopes. “To maintain the highest quality paper consistency, we use sample-based microscope inspection during all stages of our manufacturing process from filter paper and pulp samples to finished newsprint,” explains Donohue research technologist, Frank Azzoli. US$2bn Canadian firm Donohue is one of the world’s five largest paper manufacturers, producing around 2.4 million metric tons of recycled newsprint and media paper of all grades per year. In addition to five newsprint mills in Canada and two in the US, Donohue is also a huge paper recycler with four recycling operations in Canada and the US. Donohue recently purchased a Lynx stereo microscope from Vision Engineering for its Thorold Ontario site in Canada, which also inspects paper samples from three other Donohue facilities in Basie Comeau, Sheldon and Texas. The Lynx exploits what is known as eyepieceless optical technology to achieve a very wide angle of stereo (dual eye) viewing freedom that eliminates the need for inspection operator staff to stare into a pair of traditional eyepieces. The Lynx system from Vision Engineering allows users to be up to 31cm away during viewing, which combined with its angular flexibility, offers an exceptional freedom of head movement and comfort because operators are encouraged to sit correctly upright when using the instrument. The eyepieceless technology even allows users to wear glasses or contact lenses. “Our inspection operators were immediately able to adopt a far better posture for extended microscopy work and looked extremely comfortable when using the instrument,” adds Azzoli. “As a result they can now inspect paper samples with the scope for up to five hours a day,” continues Azzoli. Donohue had used traditional microscopes for eight years to examine paper contaminate counts and class (typically category 10) for particles 0.6mm2 and above. Inspection parameters included paper density property, ink removed state (free or attached), how effectively sticky labels, hot melts and glues had been removed and contaminate measures of ink, plastics, laminates, grit, sand, metal particles and fibre. In addition, Donohue used microscopes to evaluate the performance of new and existing production processes technologies, and contaminate cleaning and removal systems. While a standard stereo microscope will magnify up to around 40x, the Lynx is capable of going up to an extremely high magnification of 120x. This makes it a highly flexible and easy-to-use inspection tool which has so impressed Donohue that they are now intending to use the Lynx for an increasingly large number of applications including R & D.
Nevertheless, using an inspection tool with such high latent magnification capabilities means that Donohue is benefiting from an unsurpassed resolution quality that could not be achieved by alternative means. “We did originally consider using a high definition camera and display screen to help our operators inspect samples,” reflects Azzoli. The Lynx’s ease of use has also dramatically accelerated the inspection speed of Donohue’s operators. “Before we installed the Lynx microscope, it took our operators around 10-20 minutes to fully inspect a paper sample,” states Azzoli. Before we installed the Lynx, our operators almost feared going up and using our old microscope for inspection work. But it was a job that had to be done because we could not cut our number of random samples without failing to meet our statistical certainty requirements. The Lynx’s design ergonomics also allow the scope to be set-up and left without any further operator intervention. The Donohue operators who now use the Lynx say that the microscope has transformed the quality of their day-to-day working lives. Renishaw plc employs the use of Vision Engineering’s Mantis® stereo viewer to inspect dental frameworks for finished quality, precision and fit. Renishaw has been manufacturing innovative measuring solutions for over 33 years and has recently identified the need within dentistry for a refined and accurate process for crown and bridge framework manufacture. In doing this, Renishaw has designed and developed incise™ – a revolutionary dental CAD/CAM system that focuses on accuracy at every stage of the process, beginning with the first impression taken by the dentist. To support its own digital checking procedures, Renishaw uses Vision Engineering’s range of Mantis® stereo viewers to assist with all aspects of the process, from quality assessment of machine parts to visual inspection of the finished frameworks. Renishaw’s Dental Products Division has taken a radical review of the conventional way dental restorations are manufactured. From this, the incise™ process was born, providing an innovative solution to the manufacture of all-ceramic parts. Traditionally, the dental industry has used metal in the production of crown and bridge frameworks. Occasionally metal crowns can cause reactions resulting in gum recession and exposure of unattractive metal collars that are prone to decay collection and staining. Renishaw’s incise™ process uses a strong, hard ceramic material called zirconia (see figure 2). The material is biocompatible so is extremely friendly to oral tissues encouraging better oral health. The metal-free core gives the benefit of a more natural, translucent appearance. The accuracy of marginal fit that the incise™ process can achieve means increased resistance to decay and staining, resulting in a longer lasting restoration. To optimise the accuracy of the whole process from start to finish, Renishaw has been working closely with dentists and dental technicians to improve the overall quality of the finished restorations. Renishaw provides a set of guidelines to help eliminate errors at each stage of the impression and die process, ensuring the precision of the finished reconstruction. Initially, the patient has a consultation where the dentist provides a prescription for reconstruction to restore ideal jaw function or to improve aesthetics. The teeth are then prepared and, using Renishaw’s proven techniques and materials, the dentist takes impressions of the teeth and surrounding tissues. The patient is fitted with temporary restorations to protect the prepared areas and the impressions are sent to the dental laboratory, together with any other relevant information on the patient’s clinical situation. The model of interest is sectioned and the prepared areas are removed, trimmed and measured using the incise™ scanning machine, which generates a three-dimensional representation of the stone model. The machine scans the model using a contact scanning probe, digitising the complex form of the preparation replica. Data from the scan is then sent electronically to Renishaw’s milling centre in Gloucestershire where the zirconia framework is manufactured. Renishaw incise™ frameworks are supplied with a certificate of conformance, showing an analysis of the framework fit to the original stone model. The zirconia framework and the certificate are packaged and sent back to the dental laboratory for porcelain build-up. The finished restoration is returned to the dentist along with the certificate. The dentist will then complete the process by removing the temporary and fitting the incise™ restoration, checking the colour match and contacts with surrounding teeth and the essential marginal fit. When the dentist and patient are happy, the crown or bridge is permanently cemented in place. Figure 3 shows four anterior porcelain jacket crowns, three of which were 30 years old. It is obvious where the poor fit of the crowns has caused the gums to recede, exposing dark margins & collecting decay. Figure 4 shows the same patient with newly fitted incise™ crowns. The gums look extremely healthy and the aesthetic result is superb. Before the ceramic frameworks are dispatched back to the laboratory, they are inspected using the Mantis range of stereo systems from Vision Engineering. Renishaw has invested in a Mantis Elite stereo viewer and a number of Mantis Macro viewers with straight through viewing. After the parts have been machined, they undergo a final inspection. The cold bright white LED light of the Mantis range provides adequate illumination to inspect the uniformity of the parts. 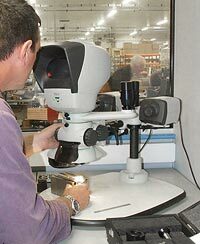 When the project was in its infancy, Renishaw was using several methods of inspection including loupes. Although this method gave adequate magnification, the practicalities of inspecting through such equipment was not ideal, especially for long term use. “With the hours that are spent by production staff peering into eyepieces of microscopes or loupes, it made sense to invest in equipment that provided maximum comfort as well as optimum clarity. “The Mantis delivered everything we needed to successfully carry out our visual inspection process. With the certificate of conformance that we are providing to our customers, it is imperative that we produce crowns and bridges that are a perfect fit. “We use the Mantis to inspect the machined parts giving us total confidence that our incise™ scanning machine is producing accurate dimensions, resulting in prosthodontic parts that are a precise representation of the patient’s teeth”. Bryan goes on to explain how having an inspection station changed the whole mindset of the inspector. “After we designed the inspection station using the Mantis, we found that when the inspectors physically took the framework over to the system and initiated the inspection procedure, it changed their whole psyche”. The incise™ scanning system is validated to BS EN ISO10360 part 4 (an international standard relating to the accuracy of contact scanning systems) and all restorations are produced under a BS EN ISO13485 quality system. With Renishaw introducing innovative measurement solutions and proven technology like the incise™ system into the medical devices industry, including dental technology, the benchmark has now been set for high precision and quality.